Are political parties the next step for Ford Nation? 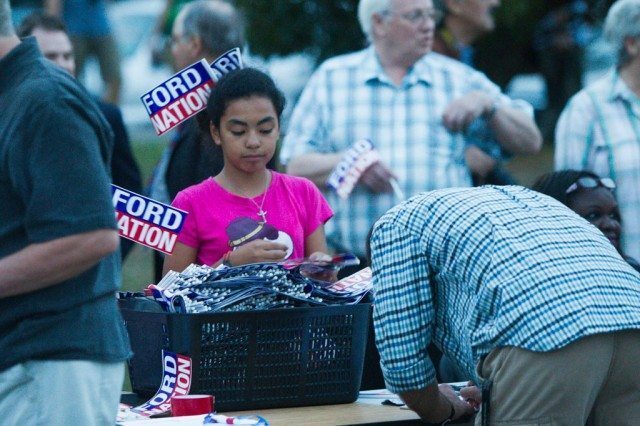 Like it or not, Ford Nation is the most powerful political movement to emerge in Toronto since the 1970s. And if you think it’s just some infantile personality cult destined to wither along with the electoral prospects of its frequently stupefied leader, Ford Nation has a surprise for you. Already, shadowy forces closely linked to the movement are manoeuvering to rig the political system so that the most powerful political force in Toronto becomes permanent. In an ironic twist, these quiet counter-revolutionaries are openly emulating an innovative political strategy first used by the Communist Party of Canada. But it’s a proven winner. And frankly, it’s hard not to admire the initiative. It certainly deserves notice. So let it be noted then that in the dying days of 2013, an obscure group calling itself The Toronto Party filed an application with the Ontario Superior Court of Justice challenging the constitutional validity of a provincial law that prevents political parties from operating openly at the municipal level. It is an excellent case in constitutional terms, and more so because the remedy—amending the Municipal Elections Act (MEA) to let parties exist—is so simple and commonsensical. If that happens, enormous new opportunities to build and consolidate political power will emerge. And the only group remotely capable of exploiting them is the most powerful proto-party Toronto has ever seen: Ford Nation. The Toronto Party is no Ford Nation. It is a tiny group consisting mainly of party founder Stephen Thiele, an Etobicoke lawyer, and a few of his friends. But in their early days, they were true heralds, preaching hard-right fiscal austerity to suburban voters who had yet to hear the phrase “gravy train.” They were Ford’s party before Ford was. And although their current initiative has no formal connection with the mayor and his brother, it’s hard not to see it as a stalking horse. Adding to the credibility of the challenge is the participation of lawyer Gavin Tighe, a colleague of Thiele’s at Gardiner Roberts LLP. Tighe most recently joined Thiele in a high-profile legal campaign to overturn the results of the latest federal election in Etobicoke Centre, on behalf of incumbent Borys Wrzesnewskyj. Although Wrzesnewskyj and his lawyers ultimately lost at the Supreme Court in a 4-3 decision, the case established basic jurisprudence on Section 3 of the Charter of Rights and Freedoms—the right to vote—which is the same clause at issue in Tighe’s Toronto Party challenge. More tellingly perhaps, Tighe is the lawyer who got Rob Ford off the hook for defaming Beaches restaurateur George Foulidis during the would-be mayor’s memorable “say anything” election campaign. And let us not forget, as we dig deeper into the heart of this cozy conspiracy, the central role played by former Communist Party leader Miguel Figueroa, who first blazed the trail the Fordists now follow. Challenging draconian federal law that outlawed small political parties like his own in the 1990s, Figueroa won a resounding victory at the Supreme Court, resulting in basic law on the matter of voting rights and political parties in post-Charter Canada. The Toronto Party’s attack on the Municipal Elections Act, using Section 3 of the Charter, is a close variation of the Communist plot that overthrew the former Canada Elections Act. And like that plot, this one makes a whole lot of sense—not only for powerful Ford Nation but even more so for its markedly less-organized opponents. Current council chaos is an obvious invitation for some new form of organization, Tighe said in an interview, “and perhaps the answer is party lines.” In his view, the pursuit of open partisanship is a worthy non-partisan initiative. He says he’s not a member of the Toronto Party himself, adding, “I don’t even live in Etobicoke.” Common sense makes the case. On its face, the ancient and paternalistic Municipal Elections Act would seem to violate all kinds of rights by banning municipal parties. Forming a political party is surely the most basic possible demonstration of free expression and free association. But Tighe’s application focuses on Section 3, and his client’s desire simply to see its name printed next to those of its candidates on municipal ballots. “Everything in this society has a warning label on it except, I suppose, your municipal ballot,” he jokes. But it’s not as if anyone is demanding such things be imposed. Gaining the right to print fringe-party labels on ballots might seem innocuous enough. Constitutionally, it is a “baby step,” Tighe admits, leaving the all-important question of fundraising for another day. But no one who has devoted as much effort to organizing city-wide slates as Rob Ford has will fail to notice the opportunity. Politically, a new name for an upcoming slate is the obvious next giant step in the evolution of Ford Nation. The prediction relies in part on the remarkable success Ford has already had in changing the rules of the political game, especially his two victorious encounters with the same law that bans parties. His successful defence against conflict-of-interest charges that saw him briefly ejected from office made a shambles of the MEA clauses that purport to govern such things. Then Ford’s council colleagues graciously forgave him for spending $40,000 more than the MEA-legislated limit on his election campaign—happy to set a precedent that stands to benefit them all even as it mocks the law. It’s also worth mentioning Ford’s significant contribution to the ongoing liberalization of Canadian libel laws, if only because it was Gavin Tighe who persuaded the judge it’s now okay to say anything about anybody without even caring if it’s true. But that’s the way it is now. Ford and his Nation have changed everything, and are leading the way toward a new, sharply partisan municipal politics. Progressives might not like it, but they can hardly avoid following along.